For information on starting and stopping productions, see “Managing Productions.” Note that for a live, live, deployed production, InterSystems recommends that you use the auto-start option, which is described in that book. The Interoperability > Monitor > Production Monitor page displays real-time status information about the currently running production in a condensed, one-page format, with links for further details. To display this page in the Management Portal, select Interoperability, Monitor, Production Monitor, and Go. By default, this page is automatically updated at frequent intervals. In the left area, you can clear the Auto update check box to disable these updates. The Production Monitor page displays real-time information provided by the Monitor Service. The Monitor Service is a business service that is implicitly included in every production (not visible as part of its configuration). The Monitor Service continually monitors the activities of items while a production is running, and records data about them at frequent intervals. Business Service status (first cell). Green • (dot)  Active and OK.
Yellow - (hyphen)  Currently inactive, but otherwise OK.
Red ! (exclamation mark)  Error. Gray X (letter X)  Disabled. Connection status (second cell). The connection status is meaningful for TCP, HTTP, FTP, and ODBC connections. Green + (plus sign)  Connected. Yellow o (letter o)  Listening. Red x (letter x)  Disconnected. Gray - (hyphen)  Not applicable, disabled, unscheduled, or not connecting. Queue Contents  Click to view the production queues. For information, see “Monitoring Production Queues,” later in this chapter. Business Operation status (first cell). Gray • (dot)  Retry. The business operation connection failed and the operation is retrying the connection. If you select the name of the operation, the left area is updated with details and the same links as for the Input Connections table. The Queues table (lower left) lists the status of InterSystems IRIS™ internal message queues and how many messages are currently waiting in each queue. This table uses the same icons and color-coding as the Input Connections table. If you click an item in this table, the left area is updated with details and the Queue Contents link. The Event Log (lower right) summarizes recent entries in the Event Log. If you select an item in this table, the left area is updated to show details of that Event Log entry. It also displays the Event Log link, which you can use to see the entire Event Log. Component to monitorwhen you start the Production Monitor, the Activity Graph shows the messages for all incoming and outgoing connections. 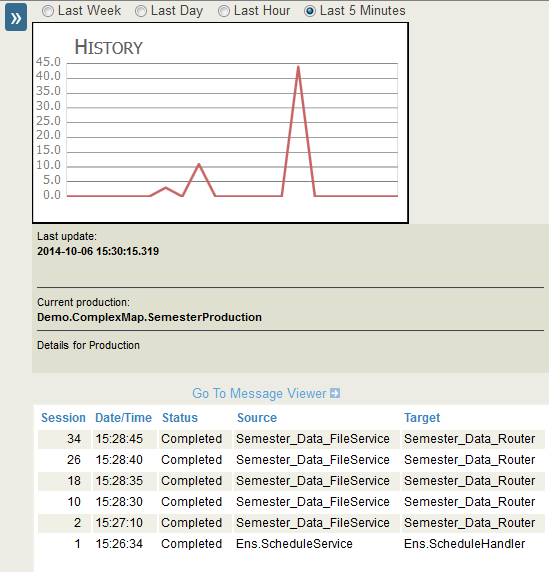 If you select an incoming or an outgoing connect on the Production Monitor, the Activity Graph shows the activity for the selected component only. If you want to return to the activity of the entire production, select on the currently selected connection to deselect it. Auto updateif this check box is selected, the Production Monitor regularly updates the Activity Graph. Last weekdisplay the activity for the previous 7 days. The vertical axis specifies the number of messages per hour. Last daydisplay the activity for the previous 24 hours. The vertical axis specifies the number of messages per 15-minute interval. Last hourdisplay the activity for the previous 60 minutes. The vertical axis specifies the number of messages per minute. Last 5 minutesdisplay the activity for the previous 5 minutes. The vertical axis specifies the number of messages per 15-second interval. See “Adding Business Metrics to the Production Monitor,” in Developing Productions. 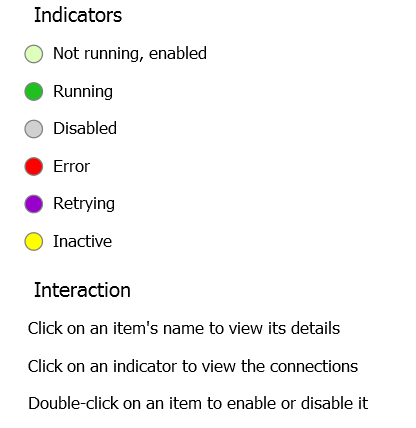 The Interoperability > Monitor > Queues page shows the current state of all the message queues being used by the running production in the selected namespace. Name  The name of the configuration item that has the queue. It may be different from the host class name. Count  How many messages are on the queue. This value is a snapshot and may change when you refresh the page. Active  The number of active messages. Creation Time  The date and time when the queue was first created. To see the contents of any given queue, select the row for that queue. The active messages and queue contents for that queue are displayed. If you select an entry in the queue contents or active messages, information about the message is displayed. You can refresh the list of queues and contents by clicking the refresh arrow. You can also specify the time period to automatically refresh the list of queues and the active messages and queue contents tables. The Active Messages table is displayed when there are active messages in the selected queue. It has one row for each active message, which identifies the message and its state. If you select one or more messages by checking the check box, you can abort or select the selected messages. Index  This integer value starts at 1 for the first message placed on the queue after the production starts, and increments by 1 for each successive message. A message has the same Index value for the entire time it is on the queue. Index values are never reused. Priority  The priority of the message. See “Message Priority” in the first chapter. MessageId  The object identifier for the message. Select messages by checking the check box for the messages. Click Abort to abandon any ongoing attempts to send one or more messages selected with the check box. Click OK to verify the operation. Click Abort All to abandon ongoing attempts to send all the messages in the queue. You must then click OK to verify the operation. Select a page number to view that page in the list. Selecting |< displays the first page, << displays the previous page, >> displays the next page, and >| displays the last page. By looking at queues and jobs, you can often quickly spot a problem in the system. For a business service or business operation, if a queue is suddenly longer, this generally means that there is a problem communicating with an external system. An external connection may be down, or there may be a peak-hour effect that is affecting throughput on your external connections. For a business service or business operation, if a queue is consistently long, this generally means that there is a consistent delay in sending messages. You should probably examine the external connection to see if there a performance problem that you can solve. If that is not possible, you could increase the appropriate pool size (unless you need to ensure first-in-first-out processing). See “Pool Size and Actor Pool Size” in Configuring Productions. For a business process that uses a private pool, if a queue is consistently long, you could increase the appropriate pool size (unless you need to ensure first-in-first-out processing). If the actor queue is suddenly longer, a business process may have experienced an error that has caused it to become stuck in some way. If the actor queue is consistently long, the actor pool for the production may need to be larger. If many queues have a consistently large buildup, there may be a general capacity issue on the host computer, the production (in its role as a CSP application) may need more resources, or the underlying InterSystems IRIS installation may need to be tuned. For suggestions, see the System Administration Guide. In general, however, you will be able to keep queues moving with the simpler adjustments listed in this topic. The Interoperability > Monitor > Jobs page shows the currently active jobs for the production in the selected namespace. Job  Internal numeric identifier of the job. Configuration Name  Configuration name of the business host for which this job was started. Each time a business service, business process, or business operation needs to do work, it starts a system job in which to complete its tasks. This job comes either from a private pool of jobs belonging to the business service, business process, or business operation, or (in the case of a business operation) it may come from the public actor pool for the production. When the task is done, the job returns itself to the pool of jobs from which it came. A production might need to start and stop several different jobs to complete a single request. The details depend (in part) on whether requests are made synchronously or asynchronously. For example, if a job is required to wait, the job returns itself to its pool during the wait time to free up that resource. Mode  Either Background or Foreground. Status  Typically, this is running or dequeuing. Detail  Any additional detail that is available for the job. Active Message  ID of the message currently being processed, if any. State  Typically, this is active. By looking at jobs and queues, you can often quickly spot a problem in the system. Most jobs spend most of their time in a dequeuing state while they wait for messages. During shutdown they should become quiescent. If the job does not become quiescent during shutdown, that likely indicates a problem. If the job is constantly in a running state, that also indicates a problem, unless you expect the component to be doing a lot of processing (and it is actually completing this processing). Jobs that are marked as dead are jobs that have been terminated for some reason and InterSystems IRIS has detected that the job is no longer present on the system. This is normally an indication of a serious problem and should not occur. Also, if InterSystems IRIS detects a dead job, it writes an error to the Event Log. 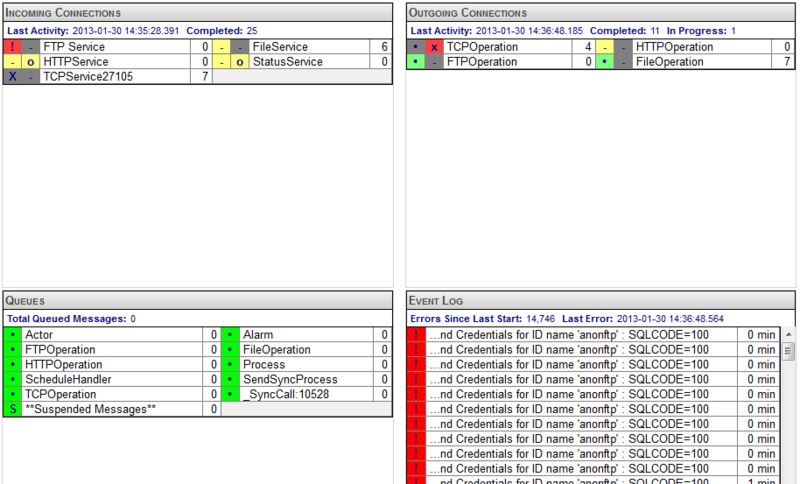 InterSystems IRIS provides another way to view a production, the Interoperability > Configure > Production page. Note that the primary purpose of this page is for configuring productions as described in Configuring Productions. If the state of a production is Running, then a production has been started and is operating normally. This is an acceptable state. If the state of a production is Stopped, it is not running and all of its queues are free of synchronous messages. This is also an acceptable state. In some cases (usually during development), you might see the Update button on this page for a production that is Running. Click this, and InterSystems IRIS updates the production to resolve the discrepancy. For an explanation, see “The Update Button” in Configuring Productions. A production acquires the Suspended status when, at the end of the shutdown sequence, some queues still contain synchronous messages. You can start the Suspended production again to permit these messages to be processed. However, if the underlying problem is not resolved, you might acquire more synchronous messages in the queue without processing the previous messages. Therefore, if a live, deployed production goes into a Suspended state, contact the InterSystems Worldwide Response Center (WRC) for assistance. If a production becomes Suspended during development, see “Correcting Production Problem States” in Developing Productions. In this case, you can use a procedure that discards the messages. A production acquires a status of Troubled if InterSystems IRIS is stopped but the production did not shut down properly. This can happen if you restarted InterSystems IRIS or rebooted the machine without first stopping the production. In this case, click the Recover button.